November 28, 2013 – the 7th International Theological Conference of the Russian Orthodox Church on the Modern Bible Studies and the Tradition of the Church convened by the Holy Synod Decision of January 30, 2013, concluded its work at the conference hall of the Department of the External Church Relations in Moscow. The forum was attended by leading bibleists and theologians of the Russian Orthodox Church, secular scholars and specialists from abroad. The first plenary session on November 26 was opened by His Holiness Patriarch Kirill of Moscow and All Russia. He noted the need for the reception of achievements made by modern bibleistics in the context of the Holy Tradition of the Church. 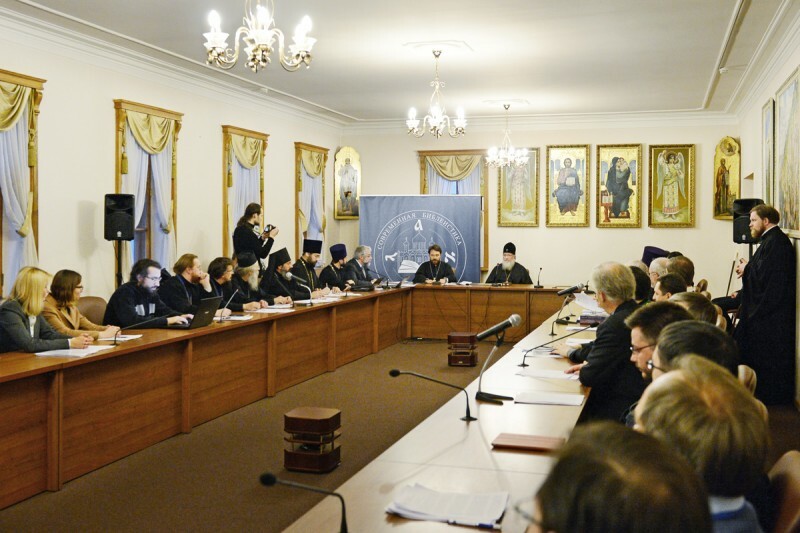 In this connection, His Holiness also pointed to the need to develop relations between church educational institutions and research and education centers both in Russia and other countries and to the importance of teaching ancient languages in the theological schools of the Russian Orthodox Church. Metropolitan Hilarion of Volokolamsk, head of the Department for External Church Relations, chairman of the Synodal Biblical and Theological Commission and rector of the Ss Cyril and Methodius Institute of Post-Graduate Studies, presented a programmatic paper on the Translations of the Bible and Modernity. Among the speakers at the plenary session were also Metropolitan Antony of Borispol and Brovary, chancellor of the Ukrainian Orthodox Church and rector of Kiev Theological Academy, Archbishop Vincenzo Paglia, president of the Pontifical Council for the Family and president of the International Catholic Biblical Federation, Prof. Christos Karakolis, University of Athens, M. Seleznev, head of the Chair of Bible Studies of the Ss Cyril and Methodius Institute, V. Akimov, pro-rector, head of the Chair of Bibleistics and Theology at the Minsk Theological Academy, and Prof. Johan Lust, Catholic University of Leuven. The conference continued its work in sections under the themes “The Bible and its historical context”, “The biblical exegesis in the church tradition”, “The translation of the Bible”, “The reception of modern biblical scholarship in the Catholic Church”, and in the round tables on “The Six Days and its context”, and “The translations of the Bible in the languages of peoples comprising the flock of the Russian Orthodox Church”. The round table on “The Six Days and its context” was organized as part of the preparation of documents for the theological commission of the Inter-Council Presence of the Russian Orthodox Church on “Relationships between faith and science” and “On the origin of the world and man”. The results of the round table on the Translations of the Bible will be taken into account by the Inter-Council Presence in its work on the documents “The Church’s attitude to the existing various translations of biblical books” and “Publishing materials facilitating the understanding of scriptural texts used in the liturgy”. The discussions were summed up at the closing plenary session chaired by His Holiness Patriarch Kirill. The Primate gave, on the whole, a high assessment to the level of the work carried out by the conference while making a number of critical remarks. In particular, he expressed the conviction that further work on the Russian version of Scriptures could be carried out only in the vein of the Cyril and Methodius tradition, which makes it topical to prepare a critical edition of the Slavonic Bible. The Patriarch called to continue this work, which was initiated as far back as the last century 70s with the direct participation of His Holiness, then rector of Leningrad Theological Schools, and Prof. A. Alekseyev. “Can we speak of a modern translation at all in a full isolation from the Cyril and Methodius biblical tradition which is part of our cultural and spiritual legacy? To make a fully solid Russian translation, we need to make an in-depth study of the Cyril and Methodius tradition and to do it we need to collate diverse versions and publish a critical edition of the Slavonic version of the Bible. We keep talking about the importance of the Slavonic text but we still have no critical edition. It is a complicated task indeed requiring great intellectual efforts and a considerable number of highly-qualified scholars, but it is much easier to do today than it was forty years ago”, the Patriarch said. His Holiness also noted that the Synodal Version, for all its shortcomings, is still intelligible for any Russian native speaker and stressed the importance of continuity in the work on a new Russian Bible. Commenting the results of the round table on the Six Days and Its Context, Patriarch Kirill remarked that the Orthodox tradition does not accept either extreme forms of creationism or attempts to see in the Bible story a confirmation of the evolution theory. “It is my profound conviction that those scholars and theologians are wrong who insist on the literal reading of Scriptures. For me, the Book of Genesis and especially the Six Days is a coded message from above and all the attempts to decode it today are very relative. We should have trust in that it is the word of God. And then some unexpected events can happen and much of what we cannot understand today may be revealed to us at some moment”, he said and continued, “How a biblical text is to be taken? It should be taken by the faith and the heart. The Bible as a document stamped with a cultural, historical and philological context at the same time bears eternal immutable truths, which are assimilated and interpreted by every subsequent generation in a different way”. Concluding his remarks, Patriarch Kirill said that he was satisfied with the work carried out by the conference and that the present biblical studies, especially in the field of translation, should be linked with the earlier work carried out by the clergy and secular scholars, who, at the risk of their carrier, developed semi-legal relations with the Church in the person of the rector of Leningrad Theological Academy. To charge the ROC Education Committee with considering a possibility for introducing Hebrew to the Bachelor’s program of the ROC theological schools. The results of the forum will be considered by the Synodal Biblical and Theological Commission at its next session.